Want this information to go? Click here for your FREE downloadable list of the top 40 Questions to Ask a Dog Breeder Before Buying a Puppy. Second only to getting married and having children, buying a puppy is one of the most exciting events in a person’s life. Especially if you are anything like Big Dog Mom. When I am in the process of finding a dog breeder and buying a puppy, I eat, sleep and breathe puppies. Buying a puppy is a euphoric experience that only comes around a few times in a person’s life. But before the big day when you bring your furry bundle of joy home, you have to first find a dog breeder. Find a reputable dog breeder that is. I am here to help with that process. To ensure you find the RIGHT dog breeder and BEST puppy for you and your family. If you haven’t done so already, you may want to read, The Ultimate Decision Guide for Selecting A Dog Breeder. In that post, I outline WHY choosing a dog breeder is a critically important decision and the 10 factors you need to consider as you narrow your search to find a reputable dog breeder. Once you have done that, come back to me. At this point you will have narrowed down your search to just one or two prospective dog breeders, three at the most, from whom you will be buying your new puppy. 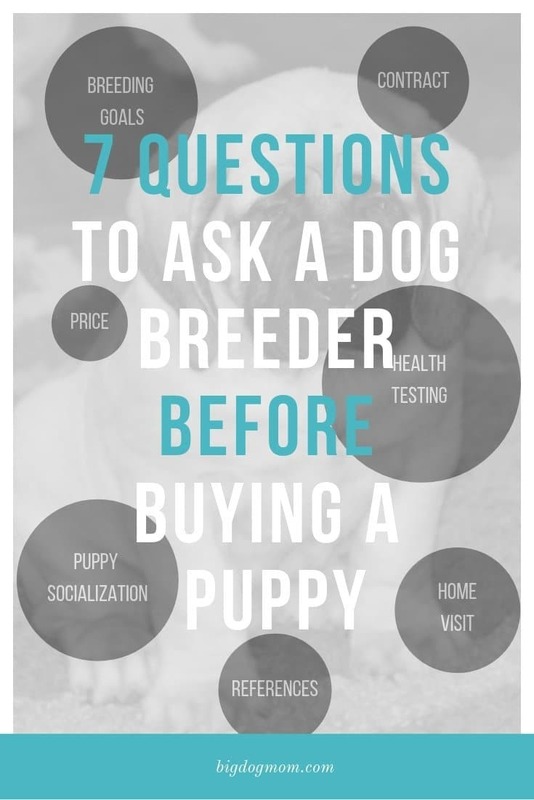 The following are a list of 7 questions I recommend you ask a dog breeder before buying a puppy. I have developed this list of questions over the last 30+ years; honing, tweaking and perfecting them after each experience of buying a puppy and learning important life lessons along the way. In addition to giving you the 7 primary question topics, I am going to provide you with a few example questions under each category (40 total) to give you the words to use during these interviews. Because, let’s face it… these ARE interviews. No dog breeder is entitled to the job if they are not worthy! The honor of being YOUR dog breeder is won based on merit, not the ability to breed puppies. Most reputable dog breeders can tell you exactly what they are trying to accomplish with any particular breeding. They are trying to improve any number of physical characteristics, temperament, health, etc. They have knowledge of certain pedigrees and an expectation or hope that the breeding will result in puppies better (closer to the breed standard) than either of the parents. I don’t have a set criteria for what I am looking for in an answer here, but I will say, if a breeder responded with “to make money” or “our neighbors male jumped the fence…”, I would caution you strongly against buying a puppy from them. Health testing is somewhat of a controversial topic, generating strong opinions on both sides. Some dog breeders perform every available genetic (DNA) and health screening test available, whereas other dog breeders don’t do any health testing. And many more in between these two extremes that do some health tests, but not all. Then only possible downside to performing genetic and health tests is the cost incurred. Well, that and discovering a genetic health condition. After all, if a dog breeder breeds a dog whom they know produces Wobbler Syndrome or Canine Epilepsy, what does that make them? If they don’t test, “I didn’t know” becomes an acceptable excuse. Breeding without health testing is like breeding with blinders on. Ignorance is bliss except for the new puppy owner to whom the buck is passed. When you are asking the following questions about health testing, listen to the dog breeder’s answers. Carefully. Don’t make assumptions. Ask for clarification on anything that is not 100% clear! Remember, there are no dumb questions except those questions you fail to ask. Do your homework ahead of time with respect to which genetic and health tests are recommended by your parent breed club. Each breed will be a little different so go into these dog breeder interviews with the list of tests recommended for your breed. A good tip is to write these tests as a checklist and check them off as you are given proof by the dog breeder that the sire and dam have passed. Documentation is key! For your convenience, I have included links to most of the large and giant breed dog national breed clubs on my Resources Page. “Do you perform health testing on the dogs you are breeding?” If yes, go deeper. If no, consider ending the interview. “Are there any diseases or conditions you have seen in your breeding program for which there are no genetic test?” An example might be Wobbler Syndrome or Canine Epilepsy. These diseases are genetic, however, in the absence of having a genetic marker, the best screening we can do is ask the dog breeder for disease history. Where there is no contract, there is NO obligation by the dog breeder to stand by their breeding or your new puppy. In the truest sense, this is a situation of Caveat emptor (let the buyer beware). The contract is there to protect both you AND the dog breeder in the purchase of this puppy. It holds both the puppy buyer and dog breeder accountable for specifics on what will happen should one or the other party fail to abide by the terms of the contract. Legaleeze aside, I believe a purchase contract establishes a solid foundation for the long term relationship you (the puppy buyer) will have with your dog breeder over the life of your dog. Get a copy of the contract early in the process. Ideally, you want to review the contract well in advance of the day you pick up your puppy. READ IT. What are the health guarantees? Are there any guarantees for temperament? What are your responsibilities and what are the dog breeder’s? Common components of a good puppy buyer contract will include how the puppy is to be raised, diet, training, socialization, and healthcare. In addition, most puppies will be sold on a limited AKC registration which means they should not be bred. A good contract will stipulate what type of AKC registration you will have for your puppy and what the terms are for AKC registration and breeding. Do not be afraid to ask questions for clarification about the contract. You may consider seeking council from another dog breeder or breed expert and have them review the contract. Sometimes it’s nice to have another set of eyes on what is the norm for contracts for your breed. If the dog breeder does not have a puppy purchase contract, I would walk away. Period! In my opinion, the lack of a contract is a huge red flag and a complete and utter non-starter. “Are you willing to take back the puppies you produce for any reason? How long is your return policy?” **A reputable dog breeder will take back any puppy they produce at any point in that dog’s life for any reason. “Have you ever had a puppy or dog returned to you? What was the reason? What happened to that puppy or dog? Why” **Most reputable dog breeders will have had one or more experiences in which a puppy was returned. This question is to hear the dog breeder expand on their guarantee. To hear that they stand by their dogs and their breeding program and will always be there for the puppies they produce. Click here for your FREE downloadable list of the top 40 Questions to Ask a Dog Breeder Before Buying a Puppy. You should absolutely expect to pay more for a well-bred, purebred large or giant breed puppy than you would if you found a litter announcement on Craig’s List (yikes!). The breeding, health testing, care for the puppies, and not to mention the raising, training, showing, and caring for the sire and/or the dam, all come with a hefty price tag. I don’t know of any dog breeders that breed to make money. Most are lucky to break even on a given breeding. You need to know what the total price is for the puppy and when that payment is due. Some breeders will require a deposit to hold a puppy. Beware of any dog breeder who asks for a NON-refundable deposit. Deposits are reasonable, however, a reputable dog breeder recognizes the number of variables at play when breeding dogs. Not every litter will produce the RIGHT puppy for an individual home. As such, no puppy buyer should be handcuffed by a $500 non-refundable deposit. Keep in mind, many dog breeders will have two prices for the puppies they produce, with show quality puppies coming with a higher price tag. Lastly, I know some dog breeders who will take partial payments for a puppy. In my opinion, if you can’t afford the price of the puppy in full, you should re-evaluate whether you are ready for the financial responsibility of raising the puppy and all that entails (training, veterinary care, food, etc.). Layaway works well for clothing, not for puppies. If applicable, “Your prices are significantly above/below the average for this breed. Why?” Be aware of what other breeders are charging in your breed. For example, most Mastiffs cost between $2000 – $3000, so anything outside that range would warrant this question and more scrutiny. Describe what socialization and stimulating activities are done with the puppies from 0-8 weeks? Believe it or not, there are a plethora of activities that can and should be done with very young puppies to sensitize them to the world around them. If the puppies are raised in a concrete basement with little exposure to real world sights, sounds, textures, and smells, I would walk away. I would also be mindful of a breeder that takes over the feeding and raising of the puppies from the dam. A happy medium is best for optimal puppy development. Supplemental bottle feeding is ok, but should not take the place of a nursing dam if at all possible. Both Junior and Sulley were raised in the middle of the dog breeder’s main living area. Both of my breeders used sound conditioning CD’s and provided the puppies with lots of stimulating textures on the ground, toys to play with, other animals to meet, and exposures to new people. I will spend a great deal more time in future posts discussing behavior and temperament and how to make the most of this critical period in a puppy’s life. 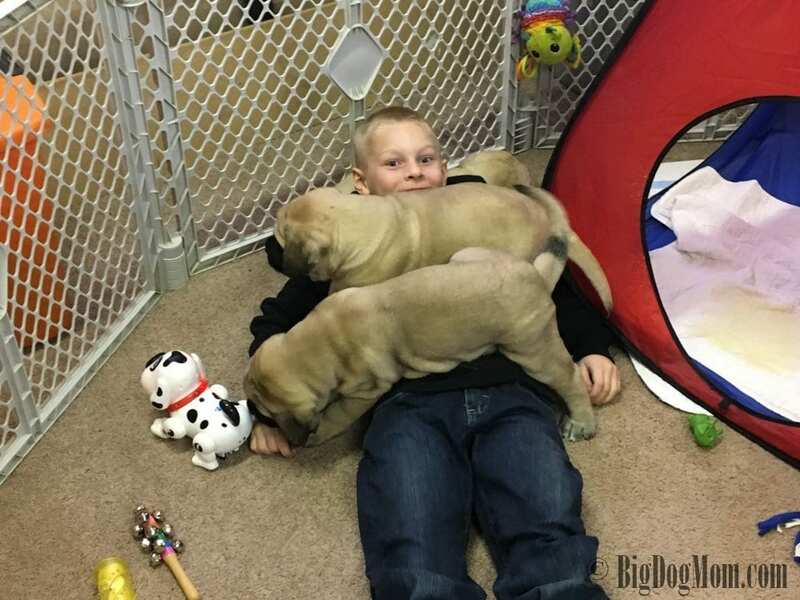 For now, I encourage you to read my interview with Jadem Mastiffs to see what a great dog breeder looks like in terms of puppy socialization. Use this as your standard and DO NOT COMPROMISE. Ask for videos of the puppies as they are growing and developing. The more video the better. These videos will serve as proof of a stimulating environment as well as each puppy’s behavior and temperament. “Tell me about how you raise your puppies?” General and open ended question. Allow the dog breeder to elaborate. “To what extent are your puppies raised with their dam? With other older dogs in the home? “I would like to meet the puppies in person before I select my puppy. Is this possible?” If a dog breeder is good about sending lots of videos and communicating with you, this step may not be necessary. The purpose of the question is to hear the dog breeder’s response. Asking for references before a major purchase or decision is commonplace in so many areas of our lives. Hiring an employee or contractor, shopping for schools for our children, picking a doctor. Heck, I even look at reviews before I buy an inexpensive toy for my dogs! Despite our desire for assurance and insurance that will protect us from our own bad decisions, most of us never ask for references when buying a puppy. We become possessed by puppy powers and lose all common sense. Without hesitation, we hand over $2,500 on the promise the dog breeder is true to her word. That this puppy is everything she says he is. We trust prematurely when trust has not been earned. So, as you are interviewing your prospective dog breeders, keep this in mind. Asking a dog breeder for a list of references is NOT an insinuation of guilt or dishonesty. It is an opportunity for that dog breeder to shine. If he or she doesn’t see it this way and gets defensive, walk away. When possible, a kennel or home visit is wonderful opportunity to not only see and touch the dogs, but to start to develop a long term relationship with your potential new dog breeder. Meeting the sire and dam of the litter is ideal, but not always possible for a myriad of reasons. If it is not possible to meet the stud dog, I recommend speaking to the stud dog’s owner or breeder as well as others who may have handled or met him. I would ask specific questions about his health, temperament and any other litters he has produced. If I wasn’t satisfied yet, I might consider reaching out to owners of any of his offspring. If I can’t meet him myself, I want to know as much information that I feel like I have met him. Typically, if you are able to do a home visit, you will be able to meet the dam. Just like with the stud, the dam should be everything you are looking for in your puppy. If she isn’t, I might reconsider a puppy out of her. I have done home visits with all but one of my puppies. It was that one that I may not have come home with had I done a home visit prior to picking him up. I have no regrets over life lessons, however. That boy touched my heart in a way that none of my others have. You can read Linus’s story in Life With An Aggressive Dog: A Letter To My Sweet Baboo. Keep in mind, the purpose of this visit is NOT to make any official decisions. It is an interview. My last piece of advice that deserves to stand on its own. During this entire process, the dog breeder you are interviewing SHOULD be asking you as many questions as you are asking him/her. A reputable dog breeder wants to know that his/her puppy is going to a family that is going to love and care for him for his entire life. Many great dog breeders I know feel as though finding a great home for their puppies is an impossible task at times. These dog breeders have earned the right to be picky about who gets one of their puppies. I have always welcomed questions from breeders and tend to be an open book with them about my big dog experience, family and kids, and schedule. For example, Junior came with a 12 page puppy questionnaire when we visited him at 6 weeks old and a 17 page contract when we picked him up at 10 weeks. And that is not including all of the emails and messages exchanged BEFORE the visit and all that have occurred since. Remember, you aren’t buying a couch here. You are bringing home a new member of your family. Take this as seriously as I can guarantee your new puppy takes it! 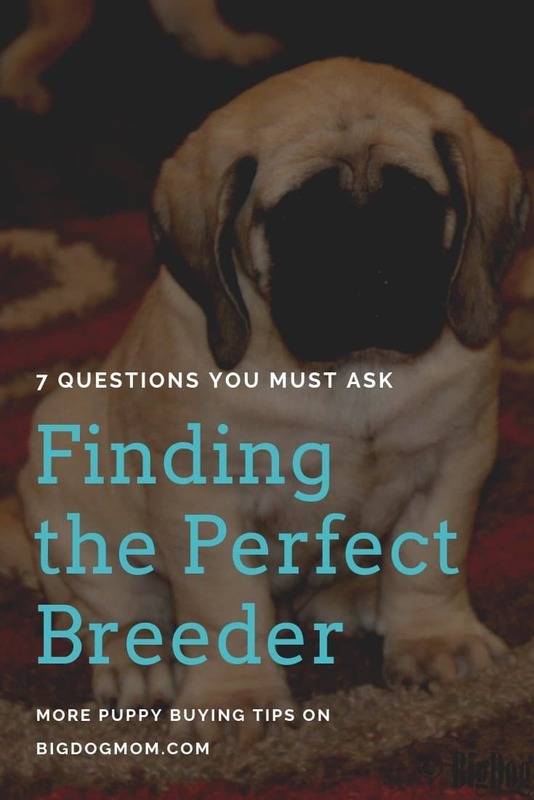 Now that you have this list of my top 7 questions to ask a dog breeder before buying a puppy, including over 40 sample questions you can use during these interviews. These questions have been honed, tweaked and perfected over the years based on my experience with the best and the worst as it relates to dog breeders. I recommend you ask these questions of each prospective dog breeder you interview. Write down and compare each dog breeder’s answers. Create a pro’s and con’s grid for each one. Getting all of this information out of your head and down on paper takes the emotion out of it. Good decisions are made in the absence of emotion. That is my take… what’s yours? Have I missed anything? Are there any questions you ask when you are interviewing potential dog breeders? Let me know. I would love to hear from you! Great post, you have pointed out some superb details, I also believe this is a very fantastic website. Thank you! I knew that part was important to include because of the number of times I have asked new puppy buyers I know “does the breeder have a contract?” and getting a deer in the headlights. The contract is really important to protect everyone, the buyer, the breeder and the puppy! Having the right questions to ask is so very important when dealing with anyone that sells puppies. I think this post gives just the right detail for anyone seeking to buy, and whilst things can still go wrong later on if you have done the prelim work as suggested it should be so much easier for them and the puppy. It is also refreshing to see that you state the breeder should be asking the buyer questions too. Thank you so much, Erin! I couldn’t agree more. When a breeder is all set to sell you a puppy without asking you any questions about what kind of home you will provide, that should be a huge red flag.